The Fashion Business Center was created to give fashion entrepreneurs the financial tools and training needed to successfully plan out a clothing line, execute spec sheets, catalogs, line sheets, tradeshows, style forecasting and much more. The Fashion Business Center is the ultimate tool that fashion entrepreneurs have been waiting for. Your life as a new clothing line owner has just gotten much easier! This tool will also come in handy while you are creating your business plan. It takes the guess work out of financial planning & forecasting. Spec Sheets / Tech Packs: If you want to get your clothing line made there are few things you need. You need sketches (regular and technical sketches) + a spec sheet detailing your design. The Fashion Business Center helps with the Spec Sheet issue. It has a host of specification sheet templates so that you can add details about how to make your line. This document is the single most important thing you need to get your clothing made. Order the Fashion Business Center today if you are planning on getting your line made. Plus it contains must more helpful information! – What are all of the factors that go into planning out your financial strategy when it comes to a clothing line. – Virtually every kind of fashion related document that you will need is here at your disposal and much more! This tool ties together what you learn in our 1 Book How to Start a Clothing Line Course and Digital Fashion Pro and gets you totally ready to succeed in the Fashion Industry! There is no other tool like The Fashion Business Center in the world! It is imperative that you have this fantastic tool. 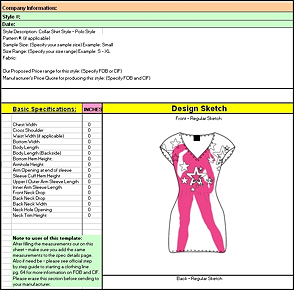 Get a host of fashion documents / templates that you will need from spec sheets to line sheets, from order forms to a custom built income statement forecast templates specifically designed for the fashion entrepreneur and much more! You will even learn how to create databases for mass mailings! This is the business tool you have been waiting for! 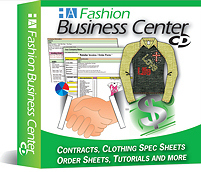 The Fashion Business Center was created to give fashion entrepreneurs the financial tools and training needed to successfully plan out a clothing line, execute spec sheets, catalogs, line sheets, tradeshows, style forecasting and much more..
Microsoft Excel and Word. You can still watch the training videos without having Excel or Word on your computer. However, you will need those programs once you get ready to use the templates. You will need up to 500 MB on your hard drive if you choose to load the videos on your computer. This product is delivered on USB. Once the designer is pleased with the garment design its measurements can be taken and sent to the manufacturer. Or the garment can be unstitched and separated into individual pattern pieces. In this case, each piece is laid flat and traced onto paper or card to make a permanent pattern. These are usually stored in large envelopes – one for each garment – with a ‘spec sheet’ attached to the outside, so that the designer can readily identify each garment. Spec sheets will include a technical illustration of the flat garment, with garment specifications such as measurements, fabrics, trims, and buttons or zippers to be used, and which season or collection it was designed for. 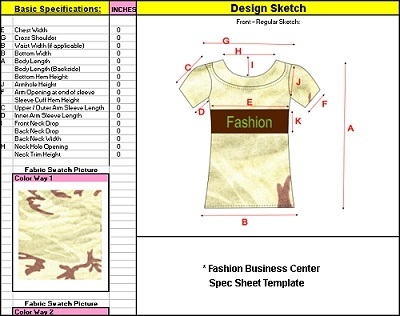 You can find clothing spec sheet templates, along with information on how to create and distribute these to manufacturers, on The Fashion Business Center. When measuring a garment, make sure the buttons or zipper is closed. Lay it flat on your worktable and smooth out any creases or folds. Thin, stretchable fabrics can be laid on top of a large sheet of heavy cotton, so that it doesn’t slip or stretch during the process of measuring (usually with a plastic measuring tape). Measurements can be taken from different points on the garment, and some designers might include a ‘how to measure’ guide when they send the spec sheet to their manufacturer. However, a center front (denoted ‘CF’) and center back (‘CB’) will always be included in the technical details. These extend the length of the garment, vertically, at the center point (half way between the two sides, or center of the neck). Horizontal markers, such as the bust/chest and waist, will intersect with these. If measuring a shirt, blouse, or jacket, etc., the chest/bust is measured from side to side, usually one inch below the armholes at the side seams. The waist is measured in the same way, except lower down at the narrowest point of the garment. On a skirt, dress, or pants, the hips are usually measured about eight inches below the waist. When measuring the armhole, the measuring tape is stood on its side so that it can be curved along the seam. Measure from the top, at the shoulder seam, down to the bottom, at the side seam. Record all the details on your spec sheet, and send it to the manufacturer.